Fort Kent coach Robby Nadeau, right, speaks to Amanda Thibeault during a game in Houlton in September 2016. 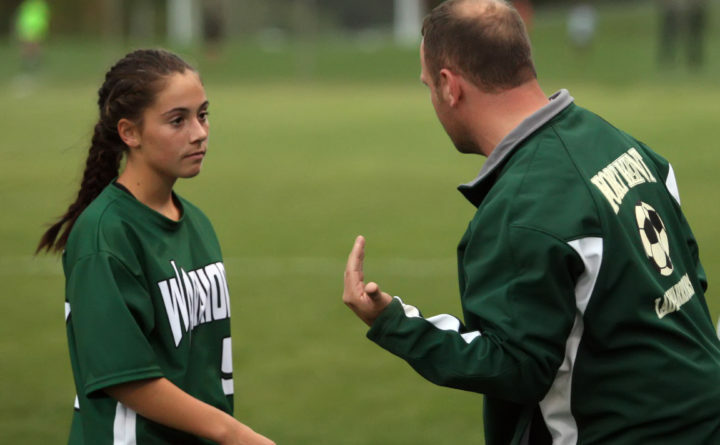 Doug Cyr has replaced Robby Nadeau as the Fort Kent High School girls soccer coach. He was approved by the MSAD 27 School Board recently. Cyr played soccer for three seasons at the University of Maine at Presque Isle (1995-97) and coached youth soccer for the Fort Kent Recreation Department from 2008-17. Nadeau stepped down in the spring after he became the Fort Kent Elementary School principal. Cyr, who is the human resource manager for Irving Woodlands, LLC and Irving Forest Products Inc., will inherit a team that graduated six players. The Warriors went 7-8 last season, losing to Central of Corinth in the Class C North quarterfinals. Fort Kent won Class C North titles in 2010, 2012 and 2014. Cyr and wife Dawn have three children, Dominic, Julia and Morgan. Morgan will be a freshman on his team this fall.